Set of four Milo Baughman dining chairs reupholstered in a tan leather. Beautiful set. 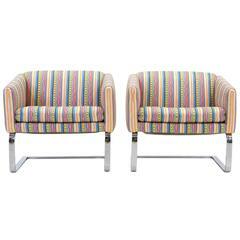 Pair of Milo Baughman for Thayer Coggin side chairs. Brushed steel frames and orange Maharam fabric. Expertly restored. Iconic thin-line dining chairs designed by Milo Baughman for Thayer Coggin. Elegant set of Milo Baughman style midcentury chairs with polished steel and off white newer fabric.